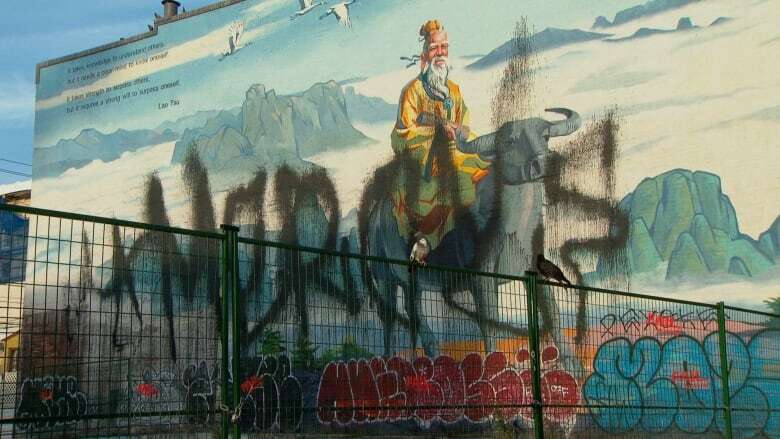 An $18,000 mural considered to be an icon in Vancouver's Chinatown has been vandalized — the second one to be defaced this month. "It's such a beautiful mural, there's no reason for it," said Chinatown resident Doug Coleman. "It's a sad state of affairs." The mural at the corner of Gore and Pender streets features Chinese philosopher Lao Tzo, the founder of Taoism. It was first put up in 2010 as a joint project by the City of Vancouver and Lee's Association of Vancouver. "We put up a beautiful picture like that, and lots of tours come by here every day and take pictures, and they can see it from blocks away," said Maurice Lee, president of the association. Vancouver police are investigating and say this is the second time in September that a mural in Chinatown has been vandalized. A series of portraits on Columbia Street that were covered in spray paint earlier this month have since been restored. Police officers have yet to make any arrests in connection with the vandalism, said Const. Brian Montague. "It's a challenge to make an arrest unless a person is caught in the act of the vandalism or there is strong corroborating evidence," he said. Montague added, given the extent of the damage, it's difficult to believe that no one saw anything suspicious. But while the first defaced mural has been restored, this latest one may be lost for good. Lee said a new building will be built in the vacant lot next to the mural next year, so it will mostly be hidden and it would be too expensive to restore it for a short time. "There's no sense to repaint it, there's nothing we can do about it," said Lee. Lee said the city will try to get rid of the graffiti, but if it can't, the painting won't be restored.